3 bedrooms, air conditioning in all rooms, one suite with double bed; a bedroom with a bunk bed; a bedroom with triliche, complete American kitchen (freezer, microwave, refrigerator), service area with washing machine. gas central heating, balcony with barbecue, living room with table and 6 chairs, sofa and tv in the living room and 2 bedrooms. sports court, swimming pool, beach service with 1 parasol and 4 chairs. It has 2 parking spaces, demarcated. great location 2 blocks from the beach in module 2. It has beach service, but only 1 parasol and 4 chairs per apartment. We do not provide bed or bath linen. O senhor Silvio muito atencioso e prestativo. O apto é maravilhoso. Minha familia se divertiu muito. Adoramos os dias que passamos em Riviera. 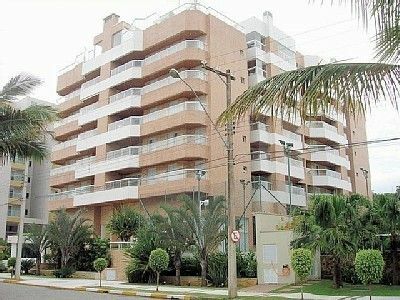 O apartamento estava limpinho, tudo conforme a descrição e o proprietário Silvio é muito atencioso e honesto. The property is situated in module 2 of Riviera de São Lourenço, in a quiet area with plenty of green area, very close to the beach (2 blocks) and close to the mall. 5-storey building, quiet, with play area, games, sauna, meeting room, party room, barbecue in the apartment, swimming pool, sports square, beach service being entitled to four chairs and one umbrella, ice maker . In google maps, you think like the mall of the oars 175.